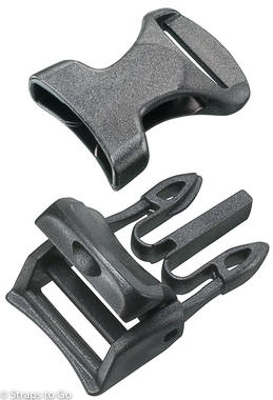 Black side release buckle with cam for 1" webbing. Acetyl material for outdoor usage. The cam provides additional security from webbing slipping and is extremely easy to adjust. This buckle is especially good if the webbing you are using is somewhat slippery like our 1" polyester or 630 series nylon. Open the LatchCam allows for easy adjustment but when closed the LatchCam keeps your webbing in place. Since ITW Nexus manufacturers this buckle, parts are not interchangeable with any of our ACW products.